For those that would like to see video on the latest software version for Navigate on Autopilot for Teslas. “Wind and solar energy saved Texas ratepayers a whopping $855.9 million in 2017 and $5.7 billion over the last seven years! Wind and solar are good for consumers, good for the economy, and good for Texas." The fundamental magic of this, as detailed in the report, is the phenomenon of zero marginal cost. Because wind and solar have no fuel cost, low operations and maintenance costs and do not suffer the wear due to ramping that thermal generation does, it’s pretty much the same cost to the plant whether it is generating power or not. Last edited by ggies; 11-07-2018 at 10:15 AM. Annual energy-storage deployments are now forecast to exceed 50 gigawatt-hours by 2020. That’s three years earlier than BNEF’s outlook from just last year. I like to re-watch some things from time to time in case I have forgotten little tid bits and so I wanted to share this video on climate models. Morris says the government's analysis didn't fully study the cumulative effects of greenhouse gas emissions, the effects of current oil prices on the pipeline's viability or include updated modeling of potential oil spills. 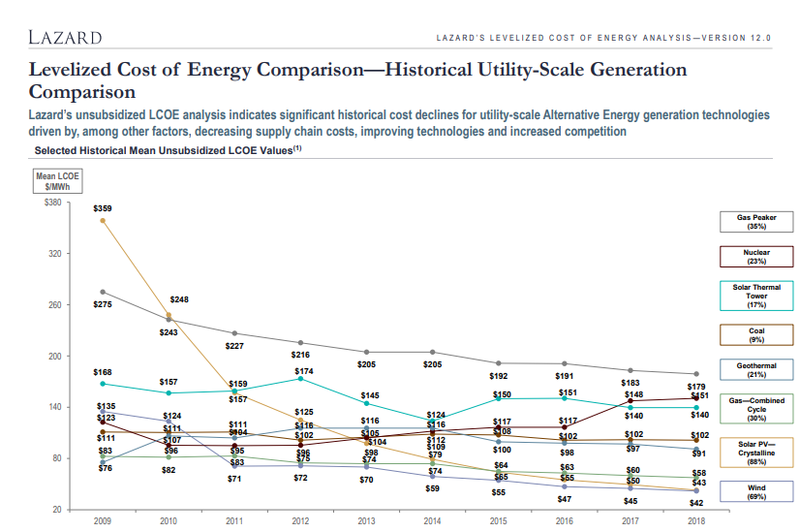 - drops in natgas prices would manage to keep them barely competitive with current solar and wind prices. Last edited by ggies; 03-14-2019 at 09:27 PM. I didn't know this, but I'm not surprised. Bottom line is $$$$. A little background on this author of this article: This guy is on my Tesla boards and I've learned a lot from him over the last 6 years. I and my family were heavily invested in oil and gas stocks for many decades because they were highly profitable. It didn’t cost that much to punch a hole in the ground and get a Texas “gusher,” and then the oil spouted out of the ground practically for free – but everyone bought lots of oil because all the alternatives were impractical or too expensive. So, they were good investments at the time. In 2008, I sold them all, including my personal $384,000 worth of Exxon stock. This was a wise decision. XOM stock is now worth about what it was when I sold it at the peak in 2008. It hasn’t gained at all. True, it did issue dividends – at a dividend yield of about 3.24%. This is well below any reasonable benchmark. This is a great summary of what's going on. I took a break from posting articles over the holidays and will resume again after catching up with work. But here is the first one: Tesla isn't the only one making an electric Pickup Truck! Another great article by Bill McKibben. He has a new book coming out in the Spring and this is supposed to be a preview of it. "Human beings have always experienced wars and truces, crashes and recoveries, famines and terrorism. We’ve endured tyrants and outlasted perverse ideologies. Climate change is different....the physical shifts we’re inflicting on the planet will “extend longer than the entire history of human civilization thus far. "